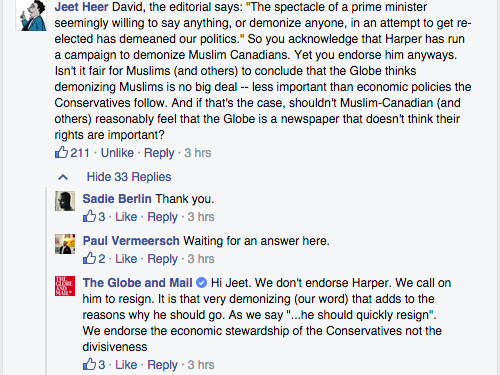 After the Globe endorsed the Harper government but not Harper, they held a Facebook Q&A to explain the decision. It did not go well. With just days until the federal election, the nation’s newspapers are lining up to offer their editorial endorsements to the Harper government. Postmedia, which controls an overwhelming share of the newspaper market, has seen its outlets position themselves uniformly behind the Conservatives. The editorials range from the nearly uncritical (Toronto Sun) to the slightly more nuanced (Ottawa Citizen). As the Edmonton Journal’s Paula Simons confirmed on Twitter, the decision to endorse the Conservatives was made by the chain’s owners. To add more intrigue to a day full of discussion on the practice of editorial endorsements, late Friday evening Canadaland reported on a developing scandal at the National Post. Although Andrew Coyne is the head of its editorial board and reportedly signed off on an editorial endorsing Harper, he wrote a column endorsing a different candidate, which was slated to be published tomorrow. Instead it was reportedly spiked by the Post’s management. For its part, the Globe and Mail released its editorial endorsement of the Conservatives today, and its twisted argument drew sharp criticisms, particularly during a question-and-answer session hosted on its Facebook page. In short, it was a tough day for both of Canada’s national newspapers, as they fended off separate accusations that their editorial endorsements were ordered up by ownership more than decided upon by editors. The Globe and Mail was one of the last publications to issue an election endorsement. My expectations were quite low, but the publication managed to do something I didn’t think was possible: write an editorial worse than the one they published endorsing the Conservatives back in 2011. This year’s is positively absurd: “The Tories deserve another mandate – Stephen Harper doesn’t.” That’s right, the paper’s owners and editor-in-chief actually make the case for re-electing the Harper government but then call on Harper himself to resign. They write that “Canada needs a change,” but then proceed to defend the status quo. And they bemoan Harper’s rotten “one-man show,” but then call forth an imaginary world where the man who has a vise grip on his party could somehow be forced to resign immediately following a final, triumphant victory. It’s like the Globe imagines a parallel universe, one in which an idealized version of the defunct Progressive Conservatives still exists, and Pat Carney or Joe Clark could just waltz over to 24 Sussex Drive and tell Harper to pack his bags. This editorial reflects not just a corporate media management and ownership out of step with the mood and feelings of ordinary Canadians, but also the magical thinking of suits who are either completely unserious observers or have a tenuous grasp on reality. 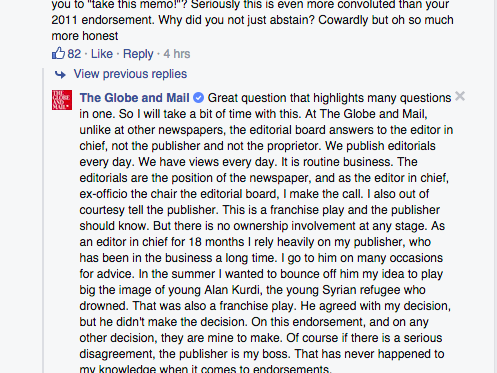 The Globe and Mail’s editorial argument was immediately criticized on social media, spawning the trending hashtag #MoreGlobeEndorsements. Undaunted, Globe and Mail Editor-in-Chief David Walmsley held a live Facebook chat on Friday afternoon to field questions about his editorial. It wasn’t pretty. Walmsley was pilloried for the newspaper’s editorial, conceding that he couldn’t find much support for his position online or in his own newsroom. Many of the questions and comments online disparaged the Globe and Mail for noting the Conservatives’ dog-whistle (and sometimes overt) xenophobic campaigning but failing to condemn it by calling for a vote for one of the other major parties. Jeet Heer, a Canadian writer and senior editor at New Republic, zeroed in on the Globe and Mail’s apparent reference to Harper’s vulgar Islamophobia throughout the election campaign. Many questions and comments focused on the question of who made the call to back the Conservatives. Was it the ownership, Walmsley as editor-in-chief, or the full editorial board as has been past practice? Last year, Canadaland broke the story of how the 2014 Globe and Mail endorsement of Conservative Tim Hudak was called in from above, overruling the editorial board who had decided to back Liberal Kathleen Wynne. Who decided on the Globe and Mail editorial? Walmsley’s description of the decision-making process effectively shuts out the rest of the editorial board, and makes him the only person who would know if the publisher and ownership interfered. This seems to be a departure from what happened in 2014, when the entire editorial board was involved, although eventually overruled. Whatever the process behind this editorial, it’s clearly, by Walmsley’s own admission, overwhelmingly unpopular online. But will it be effective in helping re-elect the Conservatives? Earlier this year, Ricochet surveyed the role the mainstream media has played in saddling us with a Conservative majority government in the first place, noting that in 2011 Harper benefitted from near-consensus support from the country’s big newspapers. (Then, as now, the Toronto Star was an exception, supporting Jack Layton’s NDP in 2011 before reverting to support for the Liberals this time). In the past four years, enjoying a majority government, Harper has expanded the surveillance state and ramped up undemocratic measures — including the stifling of free expression and dissent. It is dangerous and irresponsible for the Globe and Mail to again support Harper’s re-election, this time with the caveat that they hope the authoritarian leader who has greatly centralized powers will suddenly abdicate or be pushed out of office. All that said, there is reason for optimism, despite this last-ditch effort by the corporate media to bail out an increasingly unpopular and desperate Conservative Party. Five months ago they tried the same thing, with Postmedia, all the Sun newspapers and the Globe and Mail coming out with editorials supporting the re-election of Jim Prentice’s right-wing government in Alberta. We’ll see in a few days if these endorsements from the corporate press help or hurt Harper as he fights to hold onto power. As for media credibility, readers have already delivered their verdict about the Globe and Mail’s clumsy editorial: An epic fail.